A design competition for the Court House was held by the Provincial Government in 1905 attracting submissions from across the country and the British Empire. The winner was Francis Rattenbury from England who had also designed the Parliament Buildings and the Empress Hotel in Victoria. Before it was even completed the building was found to be too small and in 1912 the wing along Hornby Street was added by Thomas Hooper. The columns, dome and ornamentation are made of sandstone and granite in the Neo-classical style. It pays homage to the Greek and Rome origins of Western Civilization’s law and order. The marble interior and distinguished rotunda are exquisite, (the ceiling of the rotunda is shown in the header.) Sculptor John Bruce carved the pair of lions at the front of the Court House in 1910 from granite quarried on Nelson Island. 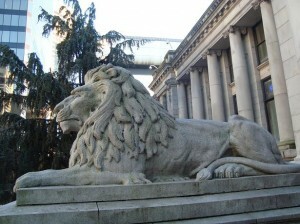 They are said to be exact copies of the lions in London’s Trafalgar Square. In 1966 the Centennial Fountain was built on the West Georgia side to commemorate the merger of Britain’s Vancouver Island Colony with the British Columbia Colony. 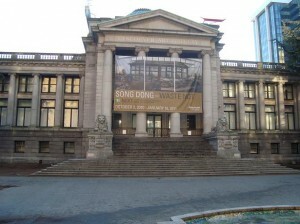 The last court case was held in 1979 as the BC Government moved their law courts to their new building just across Robson Street and the old Court House became the home of the Vancouver Art Gallery in 1983. Arthur Erickson not only headed up the design of the new Court House on Smithe Street but also helped with the renovations of the old by artfully re-imagining a place of law as a place of art. 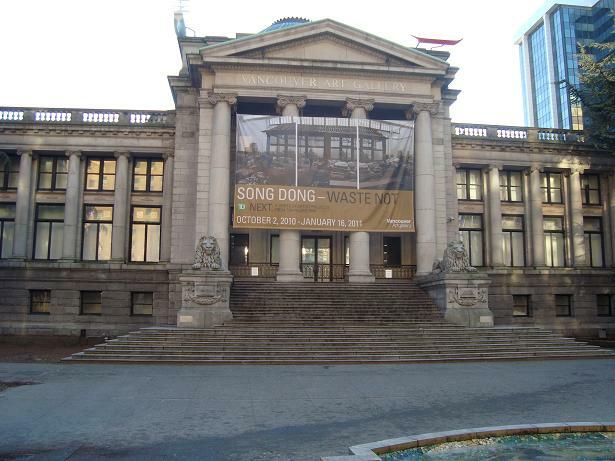 Neoclassical architecture was dynamically contrasted with the overlay of the new Modernist design making it one of Vancouver’s most significant and intriguing buildings. The gallery collection is extensive valued at more than $100 million and includes the world’s largest collection of works by Emily Carr. Currently much of the VAG collection remains in the vast storage areas below the gallery unseen due to lack of space. There is much talk of the VAG moving to a new and bigger location in the near future to accommodate the display of their large collection.